Collider, as its name implies, is a puzzle game about collision. Developed by Dan Russell-Pinson (who also created the Tipping Point adventure series), the game’s puzzles are based around physics and strategy. It’s a well designed game, with some very clever challenges. Each level requires you to place a predetermined number of circular particles around each level, and then set things in motion. Your intent is to eliminate all positively and negatively charged particles by crashing them into each other. Positive and negative “particle balls” are clearly labeled with a “+” or “-“ icon. 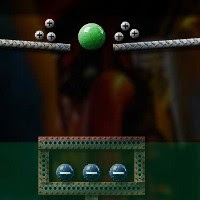 Solid green particle balls are neutral, and while they aren’t affected by collisions, they’re often necessary to solve the puzzles. “Particle balls” will also come in various sizes. Size indicates the weight of a particle, but it also indicates the size of the opposite particle you’ll need to eliminate it. If a smaller “particle ball” collides with a bigger ball of opposite polarity, the remaining (smaller) ball will represent the difference between the two. If two balls of like-polarity collide, they'll form a larger ball. Collider is a lot of fun, and will most likely get your brain working. It’s nicely presented, with a minimalist visual style that’s enhanced by some detailed textures and an impressive use of physics. Overall, it’s an enjoyable experience.